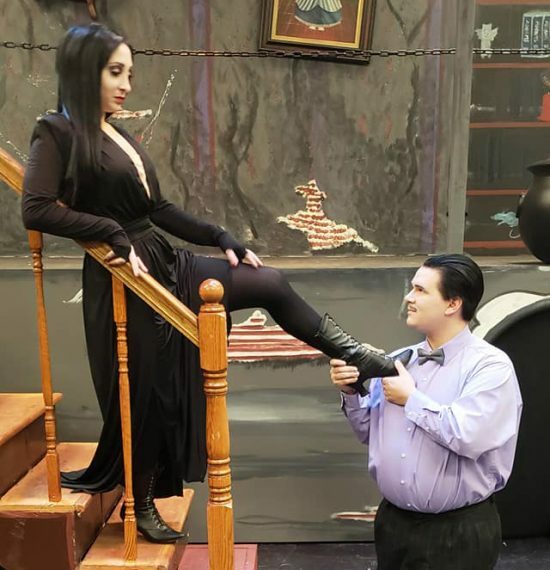 Bryce Kylie and Joshua Anderson as Morticia and Gomez Addams in The Addams Family by Stand Up For…Theatre. That’s as good of an answer as any as to why the macabre Addams Family has had such staying power in American culture, first as a single-panel cartoon in The New Yorker, then a live-action TV show, then a series of movies and, finally, a 2010 musical. The morbid group is—at least, in the musical version—really, really fun. That’s particularly true for the cast at SUF…T, especially comes to the aforementioned patriarch of the family, Gomez Addams (Joshua Anderson). According to his program biography, “The Addams Family” is the first time Anderson has performed in a show in seven years, which begs the question: What took so long? He’s pure delight, from his marvelous accent to consummate comedic timing. The rest of the cast certainly hold their own, too, as they tell the story of Wednesday (Olivia Winter) falling in love with Lucas (Jake Schwartz) and the meeting of the two families at the Addams’ mansion. Lucas’ parents, Alice and Mal (Spencer Kate Nelson and Don Lampasone, respectively), are stereotypical midwesterners—except for Alice’s quirky habit of speaking in rhyme—who are overwhelmed by the peculiarity set before them. A number of cast members, particularly Morticia (Bryce Kylie), Wednesday and Pugsley (Nyah Lampsone), have solid vocal chops, and the choreography is just—again, here’s that word—so fun, though looked certainly to be a bit of a challenge in the small space that Studio 194 offers. Kudos to choreographers Katie Sheldon and Kristen Rigsby. The set was another technical highlight, designed by Joshua Anderson and Ed Higgins, with multiple layers and fantastic dressing by Grant Myers, as well as Anderson and Higgins. It’s a shame that the set-up of the studio, with the audience sitting on three sides, creates obstructed views. The three-sided audience creates another challenge for the actors in making sure that they play to their front, left and right—that didn’t always happen. The script has its weak spots, like a strange subplot in which Uncle Fester (Sean Miller), who also serves as a sort of narrator to the show, has fallen in love with the moon (if that makes you go, “huh?”—yeah, us, too). However, the production as a whole should be lauded, from the cast to the crew, for making “The Addams Family” so darn fun. Running Time: Approximately 2 hours, 30 minutes, with one 15-minute intermission. “The Addams Family” runs through February 3, 2018, at Studio 194 at Chesapeake Arts Center. For tickets and more information, click here.